At the start of the contest the students were given a packet of 11 problems, and tasked with solving as many problems as possible. Each solution consisted of a computer program that would read an input file and generate a certain output. 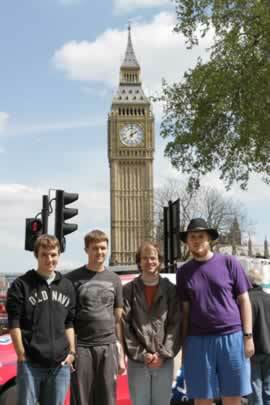 Solutions were submitted to an automated judging system (hosted by Baylor University) which performs test runs of the solution and returns a “correct” or “incorrect” result to the student team. This contest was only for certificates of recognition and bags of candy, but it also serves as a practice run (and a qualifier) for the ACM International Collegiate Programming Contest Regionals to be held on November 2, to which Messiah College will be sending six students. Nathan Chaney and Dan Baker hold their winners certificate. Andrew and Matthew hard at work on the second problem. Messiah College sent three teams with a total of eight students to compete against 14 other teams from seven schools at the Dickinson College Annual Programming Contest. Team F.R.O.G. 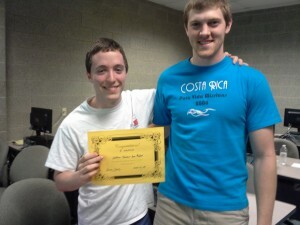 (Zach Felix and Taran King) earned first place overall, solving 7 of the 8 problems. The other two teams from Messiah– Abort-Retry-Fail (Chris Beam, Joss Steward, and Marcus Upton) and The Expendables (Zach Sizemore, Anthony Spargo, and Andy Yong) earned 4th and 5th places with 3 solutions each. The students left Messiah at 10:45 a.m. Saturday heading to Dickinson for the four hour competition, and returned around 6:00 p.m.
Anthony, Mike, and Zach work on the sample problem prior to the start of the competition. 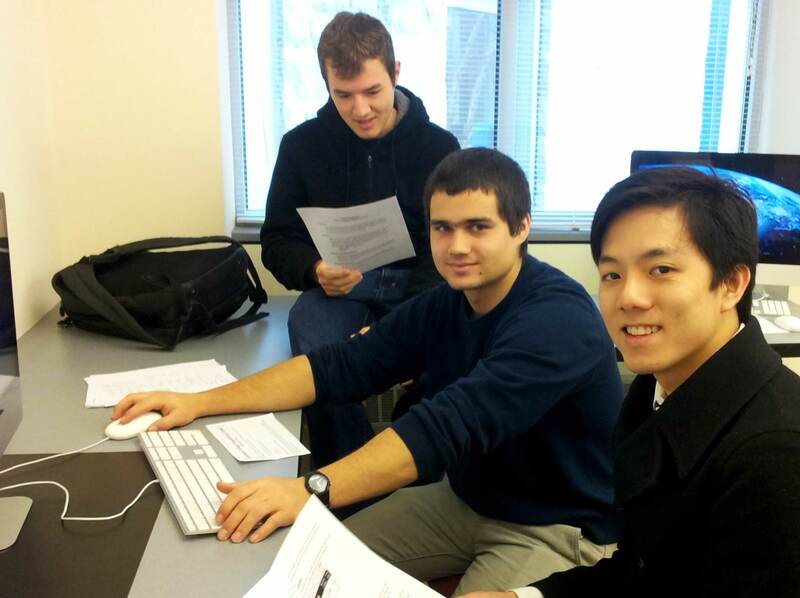 This past Saturday, November 10, 2012, six student took part in the 2012 ACM Mid-Atlantic Regional Programming Contest with 171 teams from 65 different schools. The Falcons Blue team made up of Zachary Felix, Mike Adams, and Anthony Spargo took 11th place solving 4 of the 8 problems (the first place team solved 5, so the Falcons Blue team was not far behind). 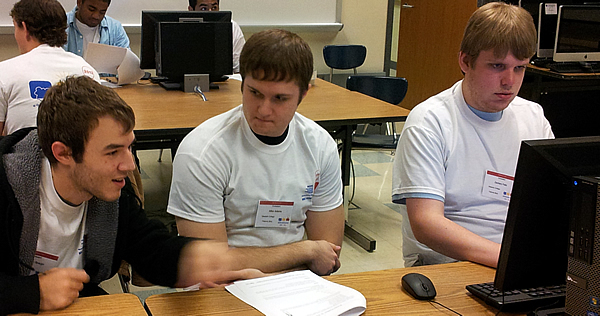 The Falcons White team made up of Nathan Chaney, Joss Steward, and Marcus Upton took 149th place solving 1 problem. Nathan, Marcus, and Joss work on the sample problem prior to the start of the competition. To put this in perspective, 17 teams did not solve any of the 8 problems, 114 teams solved only 1, 19 teams solved 2, 12 teams solved 3, 7 teams solved 4, and 5 teams solved 5. Ranking is determined first by the number of problems solved and then within those groupings, rank is determined by fastest overall time (with penalty minutes added for incorrect submissions). The teams that beat Falcons Blue were from University of Maryland – College Park (1st, 7th, and 9th places) which brough 3 teams, University of Virginia (2nd, 5th, and 10th places) which brought 8 teams, North Carolina State University (3rd) which brought 3 teams, Duke (4th, and 8th) which brought 6 teams, and Johns Hopkins (6th) which brought 2 teams. 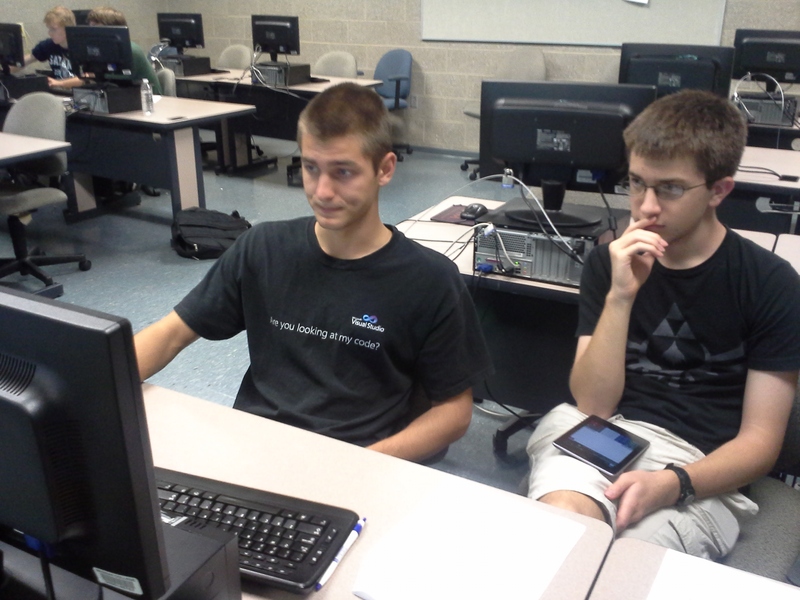 The rest of the schools in the Mid-Atlantic region can be found at http://icpc.baylor.edu/public/standings/1376. This weekend the University of Chicago held a special warm-up competition, exclusively for the 22 teams from the U.S. and Canada going to the ACM world finals. The Messiah College programming team of Michael Adams, Zachary Felix, and Anthony Spargo, along with coach Dr. Scott Weaver, traveled to Chicago this weekend to participate in this contest. Our team solved one problem, placing 20th. It was a great opportunity to practice competing with much more difficult problems and against very high-caliber teams from other schools. Thanks to our team’s great performance in November, the ACM has official invited our team to Warsaw Poland in May for the ACM world finals. This is a wonderful opportunity for our students and our school to show off our abilities and be recognized for the great academic program we have. In addition, the University of Chicago has invited us to compete in a special warm-up competition for qualifying North American schools in April. 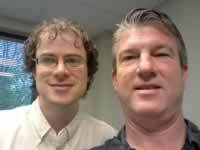 Great and exciting things are happening!